The Lady Eve's Reel Life: HAPPY NOIR YEAR! This year's festival theme is The Big Knockover, "a veritable history of the heist film." 24 films, including classics from the late '40s and early '50s along with those from the '60s and '70s plus a few from the 21st century, will be showcased during the 10-day program. 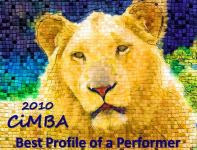 Click here for more info and links to a detailed schedule. Meanwhile in the East Bay, UC Berkeley's Pacific Film Archive will begin its In Focus: Hollywood Outsiders film series on January 18. This seven-week event, hosted by film historian David Thomson, will spotlight films by directors who worked in Hollywood but were at odds with its studio system. 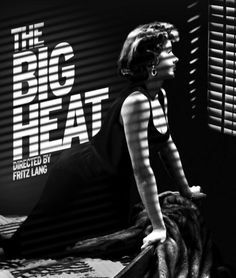 Films to be screened range from Hitchcock's great tour de force, Vertigo (1958), to the Billy Wilder comedy masterpiece Some Like it Hot (1959), and include two fine noir jewels, Nick Ray's In a Lonely Place (1950) and Fritz Lang's The Big Heat (1953). Click here for the complete schedule. Published by Applause Books in October 2016 and co-edited by Alain Silver and James Ursini, Film Noir Compendium: Key Selections from the Film Noir Reader Series is a must-read for film noir fanatics. 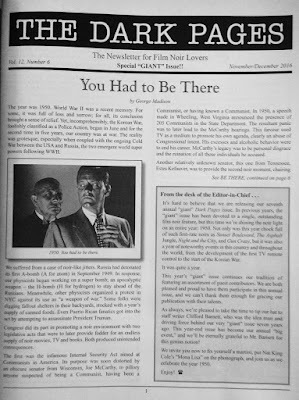 The collection consists of two sections, the first is "Classic Texts" and features an array of iconic articles on film noir, including Nino Frank's "A New Kind of Police Drama: the Criminal Adventure" (1946), Jean-Pierre Chartier's "Americans Also Make Noir Films" (1946), Claude Chabrol's "The Evolution of the Crime Film" (1955), Raymond Borde and Etienne Chumeton's "Towards a Definition of Film Noir" (1955) and Paul Schrader's "notes on film noir" (1972). 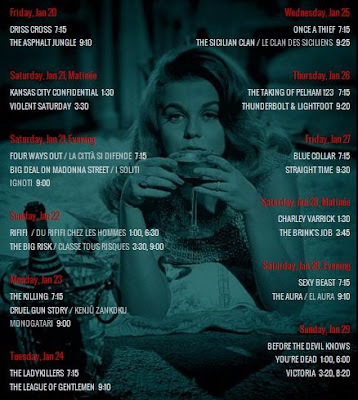 The second section, "Case Studies," is equally impressive with pieces by Alain Silver on Kiss Me Deadly (1955), Richard Lippe on Angel Face (1953), Robin Wood on Kiss Me Deadly and The Big Heat (1953), Philip Gaines on "Noir 101" and Karen Hollinger on "Film Noir, Voice-Over and the Femme Fatale." This anthology of 30+ essential essays is a course on film noir in one book, with the subject explored from a wide and fascinating range of perspectives. For more information, visit this Amazon.com page (but buy it wherever you like). 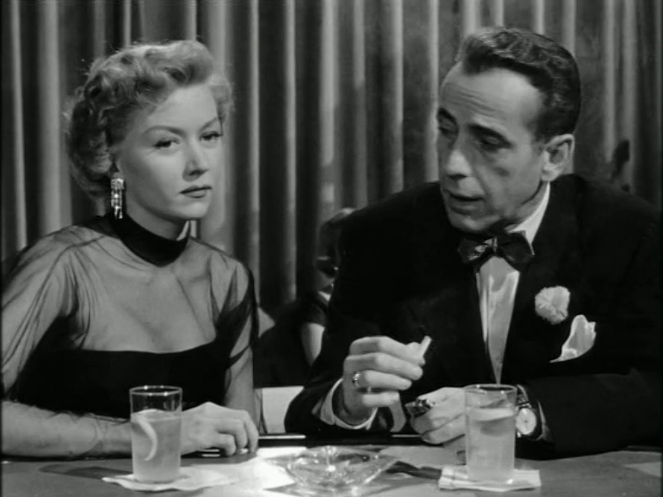 The latest edition of Karen Burroughs Hannsberry's highly regarded film noir newsletter, The Dark Pages, is now available. 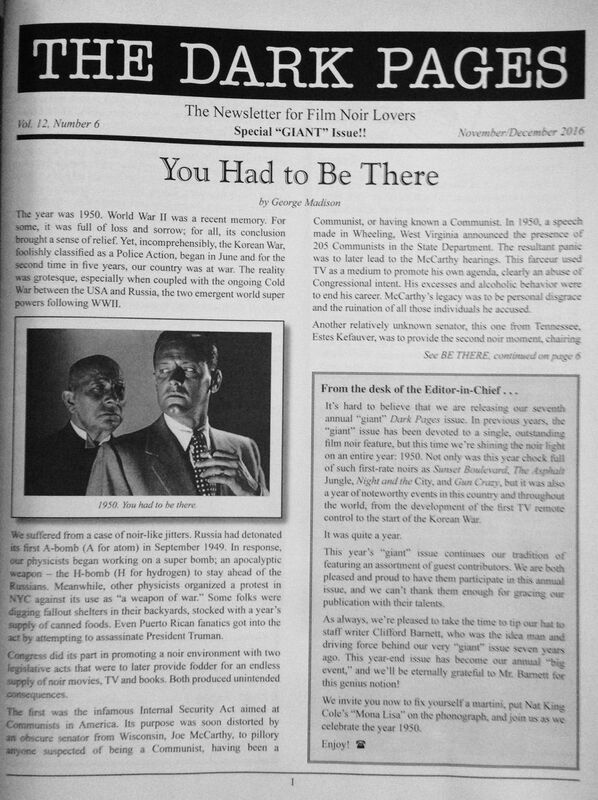 This edition takes on the films noir of 1950 and contributors offer their thoughts on particular films (One Way Street, Kiss Tomorrow Goodbye, No Way Out, Gun Crazy, D.O.A., The Underworld Story, The Sound of Fury, In A Lonely Place, Night and the City, Where Danger Lives, The Breaking Point, No Man of Her Own), on various aspects of film noir, and on 1950 in history. To learn more about The Dark Pages, Click here. Boy, nobody has any excuses for not succumbing to their dark side. I won't be attending the SF Noir Festival but thanks for letting me know about the Noir Anthology, it sounds like great reading. As was your entry in The Dark Pages on that classic, In a Lonely Place. 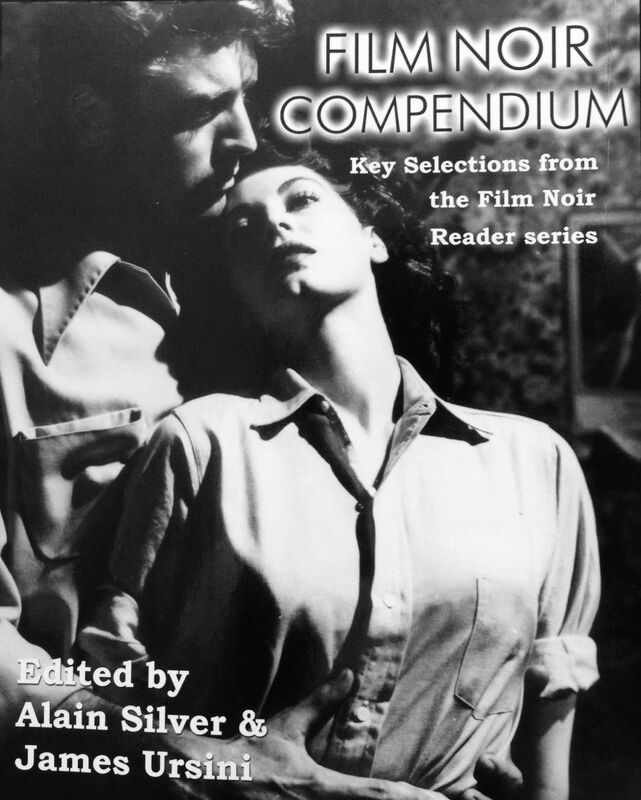 The noir compendium is fascinating. For the first time I'm reading classic essays I've heard about for years. Maybe you can get up to L.A. for some of its Noir City festival - in April, I think.